The traditional Latvian folk ensemble Skandinieki has a long and rich history. 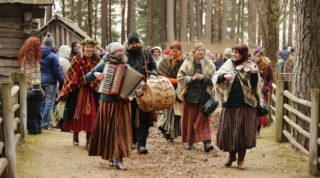 Founded in 1976, for more than forty years the group has been playing and singing not just Latvian folk songs, but also Liv folk songs – the Stalts family, the core of Skandinieki for its entire existence, are of Liv descent. Today, Skandinieki is led by Julgī Stalte. 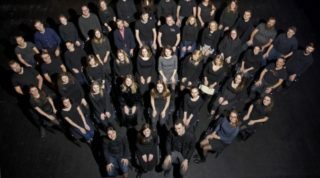 Their most recent recording is of wedding songs from the Selonia (Sēlija) region of Latvia (today, the eastern section of the Zemgale administrative district, around the city of Jēkabpils). 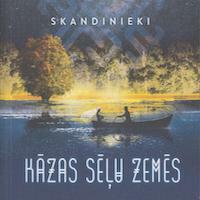 Though the Selonian language may have died out, the songs have not, and, recognizing the cultural wealth from that area, Skandinieki released the album Kāzas sēļu zemēs in 2018. The songs on the album are arranged somewhat chronologically – from songs about the couples meeting, then the wedding itself, and then concluding with songs about the wedding night. A lot of work was put into reproducing the Selonian dialect, and the group enlisted the help of linguist Maija Poiša to make the recordings as authentic as possible. There are some comments from Poiša in the CD booklet about this challenge. Reproducing Selonian was particularly difficult, as this comparatively rarely spoken dialect had, depending on which town you were in, different pronunciations for different words. There is a touch of the mystical in the song ‘Àiz upeites’, a young girl’s song about her journey across a river – a symbolic travel that leaves her past on one side (her family remains crying on one side) and her future awaits on the other side. Accompanied by the kokle, the women of Skandinieki provide an enchanting performance of this song about a young girl coming of age. The men of Skandinieki follow that up with the lively ‘Ogri müni goíļi dziéd(i)’, a story of sailors travelling to Prussian lands to find brides. An important part of any Latvian wedding is mičošana, or traditions and rituals performed late in the evening to celebrate the union of the pair. ‘Mi:čuošänas dziésma’ is about this ritual, and includes wisdom from the older, married women, and also mentions the symbolic change of the bride’s headwear – from the unmarried girl’s vainags (crown) to the married woman’s galvas rota (head ornament). There are more mystical elements in the vigorous ‘Nätìšām(i) as ìegàju’, a prayer to the Latvian goddess Laima to bless the marriage and protect the newly married couple, and the album concludes with the quiet, single-voiced ‘Gulāt ìrbe, gulāt sluóka’, the song of the grandmother as she leads the newlyweds to their bed. As with many releases from the Lauska record label, the CD booklet is full of information about the songs and the performers. Each song features notes for the melody, as well as a brief explanation of the song in Latvian and English. There are also Selonian folk beliefs, such as the belief from the town of Birzgale, where if the bride and groom have similar noses, they will be a good match for each other. Besides being a well performed and enjoyable listen, Kāzas sēļu zemēs is also a valuable folklore document, as comparatively little from the Selonia region has been recorded or released. Though the region is small, it still has a great wealth of folklore and folk songs, and, on Kāzas sēļu zemēs, Skandinieki have provided authentic and engaging performances of these wedding songs. For more information, please visit the Skandinieki Facebook page.